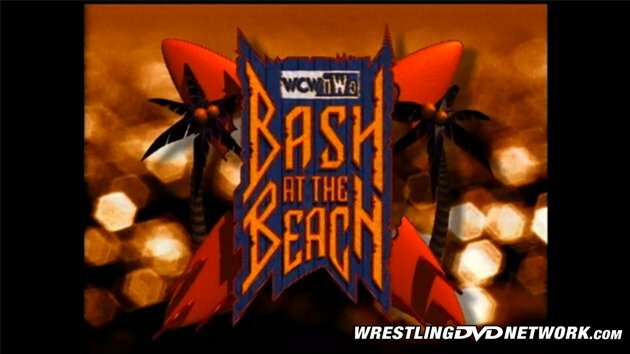 This week, straight from the WWE Network archives, Throwback Thursday celebrates the recent 20th anniversary of one of World Championship Wrestling’s biggest and most important PPV events: Bash at the Beach ’98! While the tide of the “Monday Night Wars” had shifted to the World Wrestling Federation, WCW was far from finished. But, in the midst of the most competitive period yet of the wars, WCW was forced to fight a the war on two fronts. The first, and most important, was against the WWF. The second was against their new parent company Time Warner, who demanded per-approval of “scripts” and enacted a rigid code of standards and practices that left WCW all but helpless to defend against the WWF’s move to a more adult oriented product, something WCW had done to gain the upper-hand in the first place. Rather than fight fire with fire WCW attempted to go mainstream, a world it had never found success in before, by staging the biggest crossover match since the Lawrence Taylor/Bam Bam Bigelow showdown from WrestleMania XI. NBA rivals Dennis Rodman (of the Chicago Bulls) and Karl Malone (whose Utah Jazz were coming off back-to-back NBA Finals losses to the Bulls) were the talk of the sports world thanks to their on-court “wrestling” in the epic series-ending game six of the NBA Finals on June 14, 1998. With Rodman paired with the evil Hollywood Hogan and Malone with wrestling’s everyman Diamond Dallas Page it was a story that even non-wrestling fans could sink their teeth into. The record-breaking go-home edition of NITRO, seen by some 40,000 fans live at the Georgia Dome, earned WCW their first ratings win since April 20, 1998. Though revisionist history pillories the show for giving away WCW’s biggest match (Goldberg/Hogan) for free the event helped bring WCW up to the WWF’s level in respect to publicity and helped draw the second-largest buyrate in company history for this event, behind only Starrcade ’97. 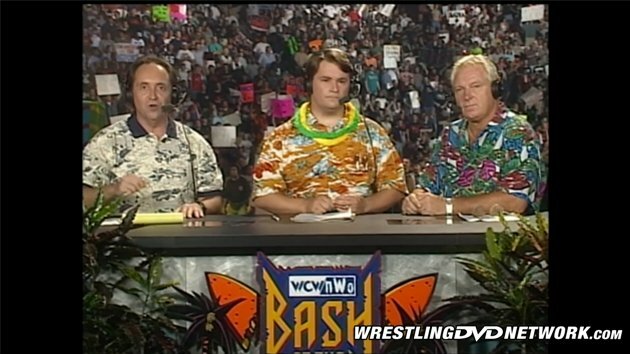 Between the go-home NITRO and the hugely successful PPV WCW earned more than $2 million dollars in the seven days leading up to Bash at the Beach ’98. But just how well does this event hold up twenty years later? Let’s hit ‘play’ and find out! Edits are few and far between (beyond the usual music overdubs) and context is complete with all previous editions of both NITRO and Thunder, as well as all prior PPVs, available for you to enjoy on the Network right now! The show opens with a surfer/beach-themed vignette highlighting Goldberg, Kevin Greene, and the big crossover tag team main event. 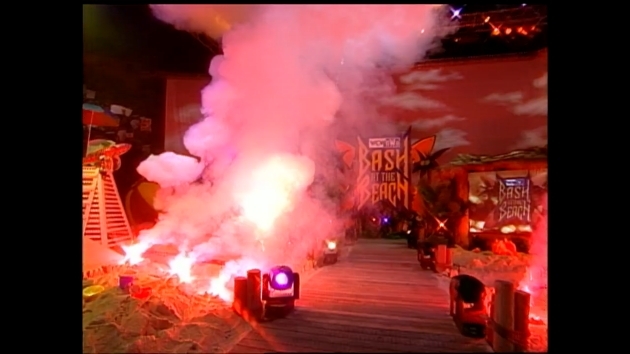 In the arena the pyro blows the doors off the Cox Arena as Tony Schiavone welcomes us to the show. At the announce position Tony and Mike talk about the worldwide interest in the tag team main event while Schiavone and Heenan talk about what will happen when the bell finally rings between Rodman and Malone. Next we go “Mean” Gene Okerlund at the foot of the stage who talks about nWo Hollywood’s Curt Hennig challenging the new World Champion Goldberg later in the show and cuts a quick promo for the WCW Hotline. Last month we saw Saturn be booted from The Flock at Great American Bash ’98 (Throwback here) following a loss to Kanyon. This ECW-lite match is a brawl from the start. Late in the match, after a springboard dropkick in the mush, we get a ridiculous, Razzie-worthy sell job from Nick Patrick. Saturn puts Raven between two tables on the outside and goes for a big elbow when Kanyon saves Raven only to hit Raven with a Flatliner on the steel chair in the ring moments later. In the end Raven survives a late Saturn comeback and, after Saturn drops Riggs with a thunderous Spicoli Driver, manages to hit an Evenflow DDT for the pinfall at 10:43. This marked Kidman’s first one-on-one PPV match in WCW. This is a great, fast-paced match that hooks the crowd from the start. While there’s not much in the way of psychology it’s filled with fantastic spots and high-flying action. In the end Juvi evades Kidman’s Seven Year Itch (Shooting Star Press) before hitting a crushing 450 Splash for the pin at 9:55. After replays we go back to the WCW internet location where Lee Marshall interviews Konnan about his sudden popularity and that of nWo WolfPac. Stevie Ray vs. Chavo Guerrero, Jr.
After some stalling Chavo offers Stevie Ray his hand and as soon as Stevie shakes Chavo’s hand Chavo drops to his knees and submits at 1:36, enraging Stevie Ray and Eddie Guerrero alike. After the match Chavo gets back on the mic and taunts Eddie, who yells as Stevie Ray for not taking care of Chavo. Unlike the previous Juvi/Kidman match this match is all about psychology and tells a great story. Eddie dominates much of the action, cutting off Chavo at every turn. In the end, after Eddie tries to cut Chavo’s hair, Eddie misses the Frog Splash. Chavo follows up with the tornado DDT and looks to have the match in hand when he, too, goes for the scissors instead. As the referee tries to pull the scissors from Chavo Eddie rolls his nephew up in an inside cradle for the pin at 11:54. After the match Eddie and Chavo argue over the electric clippers until Chavo begins to shave his own head, threatening Eddie to do the same. Eddie leaves the ring and Chavo sits down to continue to shave his head until it’s nearly bald. Next we go back to the announce position where Tony, Tenay and “Brain” talk about why Dean Malenko is out of the scheduled Cruiserweight title match with Chris Jericho. Disco Inferno and Alex Wright come to the ring and butcher Konnan’s catchphrases before trying to dance. The nWo WolfPac music hits and Konnan, Lex Luger, and World Tag Team Champion Kevin Nash come to the ring, correct all the catchphrases, and do the usual shtick. This one is over nearly as soon as it begins. After Alex Wright attacks Konnan Luger puts Wright in the Torture Rack at ringside while Kevin Nash sneaks into the ring and drops Disco with a big boot and massive Jackknife Powerbomb. Moments later K-Dawg cinches in the Tequila Sunrise on Disco for the tap out win at 2:16. This was originally to be a tag team match in which The Giant and Curt Hennig faced Kevin Greene and then-United States Champion Goldberg but with Goldberg winning the World title on the go-home NITRO the tag team match was split into Goldberg/Hennig and Giant/Greene. This would mark Kevin Greene’s final match in WCW as the Carolina Panthers insisted upon a “no wrestling” clause being added to Greene’s contract (to ensure the safety and security of their investment), effectively ending Green’s wrestling career. Although this was only Greene’s fifth match on WCW TV Greene looks impressive, particularly Greene’s selling which is better than some seasoned pros. After taking the brunt of the punishment Greene makes the comeback, landing a beautiful clothesline from the top rope before going after Giant’s knees. In the end Greene rushes Giant for a big shoulder tackle when Giant grabs Green by the throat and ends the match with a chokeslam at 6:58. Next we head back to WCW’s internet location where Lee Marshall interviews Curt Hennig, who says the secret to dethroning Goldberg is experience. Up next is footage from the go-home NITRO of Jericho and Malenko costing each other victories and of J.J. Dillon, Chairman of the WCW Executive Committee, banning both men from touching before their scheduled “no D.Q.” title rematch at Bash at the Beach. Of course Jericho, hinting that Mama Malenko was unfaithful while ol’ Boris was on the road, goads Malenko into attacking him and Malenko is removed from the match. Jericho comes to the ring with a top hat and cane and announces he’s going to dance soft-shoe for the crowd since he isn’t wrestling. J.J. Dillon joins Jericho in the ring and announces that another challenger, one who hasn’t wrestled in six-months, is ready for a title match. Jericho agrees, so long as it remains “no D.Q.”, and out comes Rey Mysterio, Jr! Though Rey had just worked the July 10, 1998 L.A. Melee Pay-Per-Listen event in a losing effort to Jericho (after Malenko interference), Rey hadn’t worked a televised match in WCW since the Souled Out ’98 event. Rey looks incredible and the fans are solidly behind the hometown boy. It’s not the cleanest of matches but it tells a great story and is good while it lasts. In the end Dean Malenko distracts Jericho, giving Rey the opening to roll through the Walls of Jericho and score the pin at 6:01. 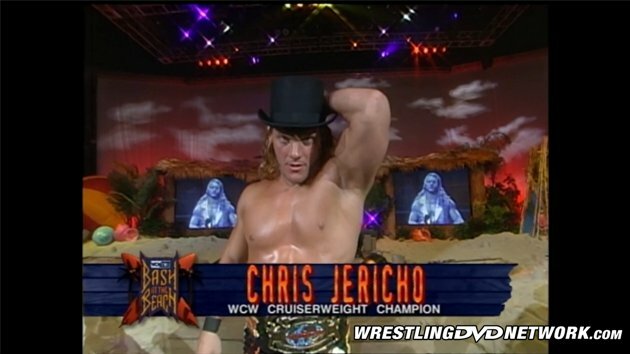 This supposedly ended Jericho’s fourth Cruiserweight title reign but the title would be returned to Jericho the very next night with neither the title loss or Rey’s win being officially recognized by either WCW or the WWF/E. After the match Malenko chases Jericho to the back where Arn Anderson stalls Jericho long enough for Malenko to catch up. The two fight backstage until we abruptly go back to the ring where Rey celebrates what he thinks is a Cruiserweight title victory. This isn’t bad for what it is but it’s over before the story can really develop. Bret dominates nearly this entire match before Booker T makes the comeback. In the end Booker T lands the missile dropkick only for Bret to get his feet on the ropes and escape to the floor where Bret grabs a chair and gloms Booker T at 8:26 to give Booker T the win via DQ. After the match Bret continues to beat the bejabbers out of Booker T with the steel chair, even cinching in the figure-four around the ring post until a disgusted Stevie Ray slowly makes the save. The divide between the brothers is really being pushed hard as Booker T is helped to the back. Next we see a vignette of the events that led to Goldberg dethroning Hollywood Hogan on the go-home NITRO. This, like the Konnan/Disco match earlier, was over nearly as soon as it began. Try as he might, Hennig is no match for Goldberg. In the end Goldberg kicks out of the Hennig-Plex before hitting the the spear and stiff looking Jackhammer for the pin at 3:51 to retain the World Heavyweight title and improve to 112 – 0. 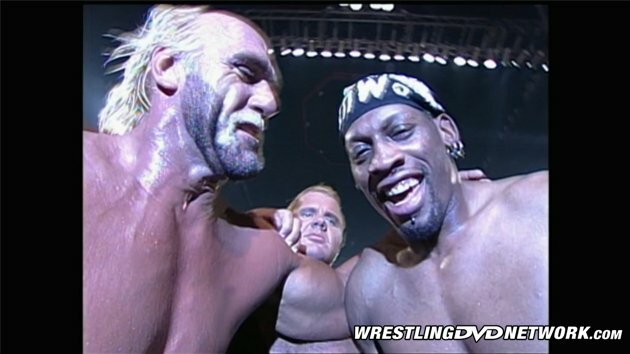 After replays we see a vignette detailing the war between Karl Malone & DDP and Hollywood Hogan & Dennis Rodman. This match more than lived up to the hype and delivered in a way few fans thought it could. Though Rodman (who no-showed the go-home NITRO after a weekend of bad publicity) looks to be a fish out of water, Karl Malone is all-in. From the work rate (well, maybe not Rodman) to the psychology this tag team showdown is a true WCW highlight that proved that given the proper ingredients WCW could do “Sports Entertainment” as well as the WWF. In the end DDP hits Hogan with a running Diamond Cutter before Malone nails Rodman with a Cutter of his own. As Malone and Rodman tussle near the ropes The Disciple sneaks into the ring and drops DDP with the Apocalypse allowing Hollywood to score the pin at 23:45. After the match Malone drops Disciple and the referee with Diamond Cutters as fans litter the ring with garbage. 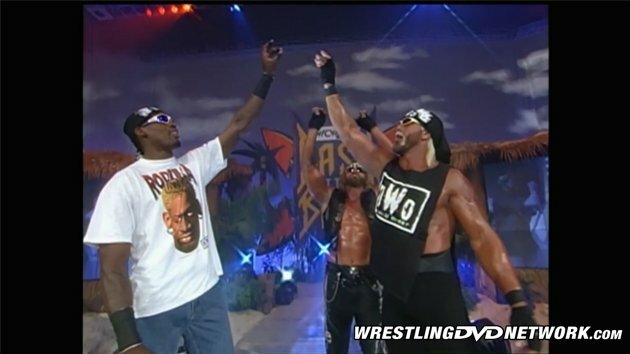 Hollywood and Rodman celebrate with the rest of nWo Hollywood as DDP and Malone leave through the crowd. Schiavone, Tenay and Heenan sell tomorrow night’s NITRO as we see replays of the main event and post-match antics by Malone. At the announce position Tony, Tenay and Heenan give their thoughts on the night before bringing the show to an end. Though a few of the matches (and finishes) leave a bit to be desired (Konnan/Disco, Booker T/Bret and Goldberg/Hennig) this event has a lot to like. The cruiserweights steal the show with the Eddie/Chavo, Rey/Jericho and Juvi/Kidman putting on arguably the best matches of the night while the main event, even with Rodman’s flubs, stands as a benchmark moment for World Championship Wrestling. If you’ve haven’t seen this event or it’s been a while this is well worth your time! Already subscribed to the WWE Network? Then you can relive this classic night of World Championship Wrestling action or see it for the very first time! For more on the WWE Network have a visit to our pals at WWENetworkNews.com. With Summerslam on the way as the next ppv I think every Throwback Thursday should be a Summerslam review and if it’s already been reviewed, re-review it as opinions may have changed with a second viewing. As the first Summerslam in Brooklyn, the 2015 edition should be reviewed for TBT the week of Summerslam 2018 on August 16 as this year’s event is on Sunday the 19th of August. True. WCW certainly had the star power to really do some exciting things. Time after time, their booking destroyed matches. Everything looked great on paper, but was implemented poorly. Goldberg’s ppv world title defense being short like this match against Henning. Makes the WCW World Title equally or more than a joke that the Lesnar’s entire UC run is. Do I need to explain the booking of the Booker/Bret match? If nowhere else to put him I’d have this be a 3 Way with Sting and be a 15-20 min bell to bell match. David Arquette’s WCW Title run, for publicity or otherwise. The entire runs in WCW of celebrities especially those officially on the active roster whomever they were, Bret Hart, Warrior. And other reasons I’m sure! Bret did say his Halloween Havoc 98 match w/Sting was the best match he had during his time there. One of Sting’s best matches during the Crow era was vs Savage and a WM closing like match on Nitro vs DDP who himself had a great match in 97 vs Savage and in Halloween Havoc 98 vs Goldberg. Great points Anan. The only decent match I can recall from Bret’s WCW run was against Benoit after Owen died. I’ll have to watch that match with Sting. Ah yes the Owen Hart Tribute match. That certainly was a great one. While you watch the Sting match keep in mind while it was one of Bret’s few good ones in WCW, not the best in either man’s respective HOF careers and that the match could’ve been booked better too. Wasn’t the worst or best is my point. But it was good, solid considering the talent caliber in the match. Oh c’mon, the hitman has several good matches in WCW. Souled Out ‘98 vs. Ric Flair, a few good ones with DDP on Nitro in October ‘98 and World War 3, one with Booker T on Nitro in Feb’ 1999, Mayhem ‘99 and Owen Hart Tribute Match with Chris Benoit. Well Bret himself doesn’t see it that way. Show him your comment there. See what his response is. I may get some heat for this but in all honesty I’m not a fan of Ric Flair. Legend, yes. Good worker, seller, talker, definitely one of the best. One of the greatest wrestlers? Longevity wise, absolutely! Heel wise, absolutely! But why I don’t like him is all these many yesrs, same guy, same music, same attire, same moves which are very very few, same promos, and every match of his I’ve seen he tries to kill himself, bleed, bloodshed. Too far too many years. As it is wrestling’s not meant for the human body. Then you go on and do this? Then he goes and calls Mick a “glorified stuntman?” when he’s putting on stunts too? They may have reconciled and gotten over this if there was any heat and if so great for them as I have great respect for both. I greatly appreciate his putting over Sting. Also didn’t like how many times he retired and came out of it to wrestle especially in TNA after that HOF in 2008, the WM24 match the night after, and the following epic retirement ceremony they gave him 24 hours later in the closing segment of RAW. At least other talent with longevity evolved themselves over the years. Taker, Kane, Sting, Jericho, HBK, HHH. They kept some things same but evolvef and adapted nonetheless. Watch any of them time to time and you’ll see what I mean. They either added something or took something out and replaced with something else.